One of the things I do to earn a crust (and keep the grumpy hormones flowing) is produce music programmes for BBC Radio Three. I work as a freelancer, employed by British independent production company Classic Arts - to whom many thanks! The main programme I make is Classical Collection, presented alternately by pianist and teacher Sarah Walker and Gramophone Editor-in-Chief James Jolly. They're both thoroughly good eggs and I love working with them - no grounds for grumpiness there! Each week's programmes are more or less loosely built around a theme - very far from loosely, when I choose them, as when we did 'Music Restored - Reconstructions and Completions' a couple of weeks ago and (slightly to my editor's dismay) every single piece fitted the theme. Yes, I never do things by halves. But next week, starting at 10:00 am on Monday 25th January, is really special and unusual: all the music, with very few exceptions, comes from LPs and has never been issued on CD. Given the rapid adoption of CD in the mid-1980s, this is surely the first time in a good two and a half decades - a generation, in fact - that this has been done for a 'routine' music sequence on Radio Three. The few exceptions are three recordings which have been issued on CD only in Japan (in two of those cases, nearly twenty years ago); and two more which have been issued on both LP and CD, by one of my very favourite record labels, Testament (these LPs are still available). In addition, all the recordings bar one were transferred by me, here behind the second stalagmite on the left, on my bank of grubby second-hand equipment, and all bat guano cleaned off using the wonderful ClickRepair. The exception to that is Paul Paray's 1953 Detroit recording of Beethoven's Symphony No.7, which has recently been remastered from an original Mercury LP by Pristine Classical, to whom many thanks for providing us with FLACs! Many of the LPs came from the BBC's large library of commercial recordings but some are my own copies, some were kindly supplied by record companies and one was lent by one of the artists, from his own collection. Full playlists for Monday to Wednesday have been posted on Radio Three's website; Thursday and Friday should follow soon (slightly less user-friendly listings can also be found at the Radio Times website). Of course, Classical Collection allows me to 'share' with fellow music-lovers many recordings and compositions which I could never post here, as they are still in copyright. Among these are the Suite from Stravinsky's Pulcinella, conducted with great verve and charm by Heinrich Hollreiser on mid-'50s Vox; the Schubert Quintet in C D.956, recorded at the 1982 Lockenhaus Festival by a group including Kaja Danczowska, a Philips digital LP which I believe was never issued in the UK; and Danczowska again, playing Mozart with Krystian Zimerman, no less, on a Polish Wifon LP. Another highlight is the estampie Chominciamento di gioia, in a fantastic early 1970s arrangement and performance by Thomas Binkley and the Studio der frühen Musik. 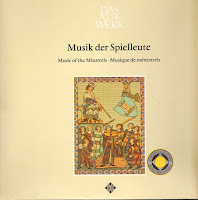 In the mid-80s, half of the parent Telefunken LP, Musik der Spielleute, was cack-handedly and quite irrelevantly tacked onto the end of a CD of Minnesänger music, which, to judge from the current policy of the bigger 'media companies', means that, even though much (not all, note) of Binkley's superb Telefunken legacy has been reissued, Chominciamento and the other overlooked pieces will now never see the light of day. Now that is grounds for grumpiness! Anything anticipated for those who could not listen to it live? Well, and if you don't post the Estampies, I will! The "grubby second-hand equipment" is intriguing. Let me guest: All triode vintage power amplifier pushing a like-stove Quads? Please, tell us something else about it.